I am so jealous of people who are seeing signs of Spring already. There’s still snow on the ground here in NY so in order to get my Spring fix I started my first indoor herb garden. I was inspired by National Craft Month and the Spring trend with the color of the year, radiant orchid and trudged out into the snow to spray paint some ugly clay pots. Luckily, Jo-Ann Fabric and Craft Store makes spring crafting easy during National Craft Month with a $5 off $25 or more purchase coupon and a spring crafting inspiration website. This simple indoor herb garden comes together easily and it makes the perfect table centerpiece or favor gift idea for a Garden Party. Great idea. Where did you find the chalkboard labels? You can find the chalkboard labels at Michaels. I believe mine were actually from Staples and are part of the Martha Stewart line. yep, still waiting for spring here in PA, too. prepare yourself for more snow, b/c i heard it’s in the forecast. this year i will be doing an herb garden, so i’m looking for some inspiration. thanks! I’m so glad you liked it. It makes a great gift as well. How cute! I have a few herbs growing in my kitchen window, but didn’t even consider painting and decorating the pots so cute like that! Next year… 🙂 Thanks for sharing. I have something similar in my kitchen. My pots are teal and navy blue. I too used spray paint to paint mine! 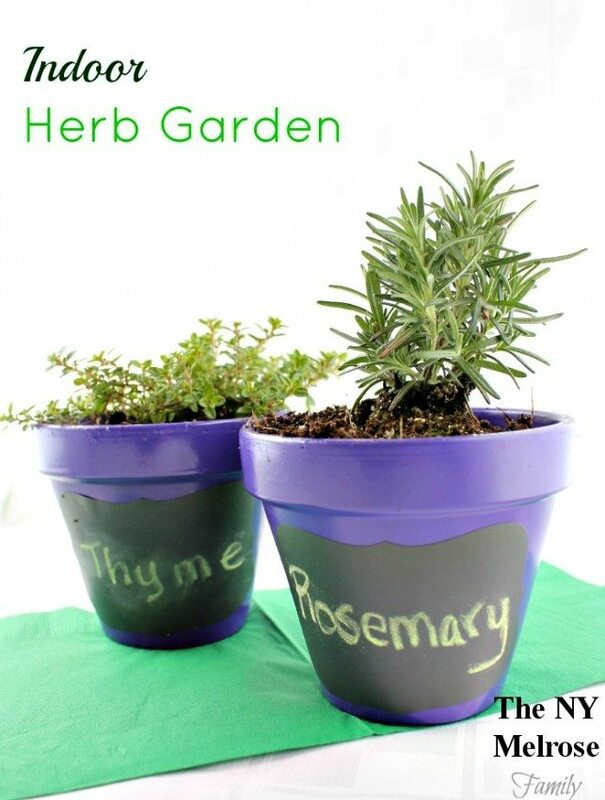 I really loved this idea, i tried the thyme planting and it worked wonderfully…but now am gonna try others. thanks for sharing this. Hi Jenny – we’re waiting for spring to actually arrive here, too! This is such a great idea and I love the purple and chalkboard labels. Thank you so much for sharing at Best of the Weekend and will be pinning! Hope you have a happy Saturday and a wonderful weekend! This is so clever and cute, Jenny! I love this idea! I love this! I’ve been meaning to add some plants to my apartment for a while… but I don’t really get much sunlight there.. 🙁 Do you think that would be a huge problem? So cute! I’m just stopping by to pin this and let you know that I featured it on my blog today!